Hîragi, Shirakawa-go – I'll Make It Myself! 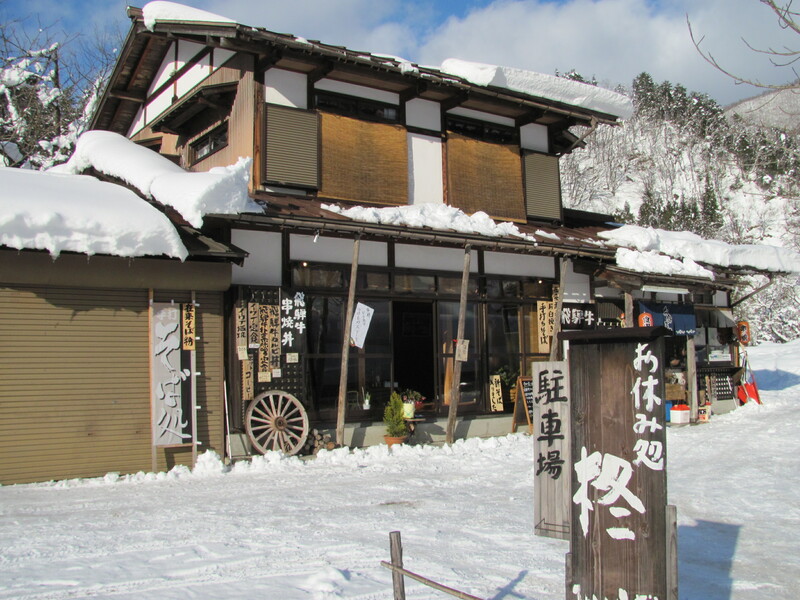 When I visited Shirakawa-go over the long weekend in January, I found Hîragi, a cute restaurant along the snow-covered the vehicle-access road to the lookout point in Ogimachi, Shirakawa-go. I was intrigued, of course, because one of my favorite kanji is 柊 (hîragi), holly, because the radicals mean tree-winter. What sealed the deal was the menu: I wanted to introduce my friends to hôba miso yaki（朴葉味噌焼き), and they wanted to try Hida beef (飛騨牛). When we walked in Hîragi, the staff was incredibly friendly, showing us to a table by a heater and confirming that the Japanese-only menu was okay with us. Their welcoming attitude made me really happy because I’ve not always had the best luck with eating out at major tourist sites. Sometimes the staff are condescending; sometimes people just assume I can’t read or speak any Japanese. (Asking is totally fair, but the attitude and assumption that I couldn’t possibly really grates on my nerves. Plus, how am I supposed to order if I don’t know the Japanese names of the foods?… I digress.) There was none of this attitude here, and I found myself liking the place more and more because I was treated warmly and with respect. Luckily, if you don’t read Japanese well, the menu has pictures. Most menu items can be ordered as a set or a la carte. 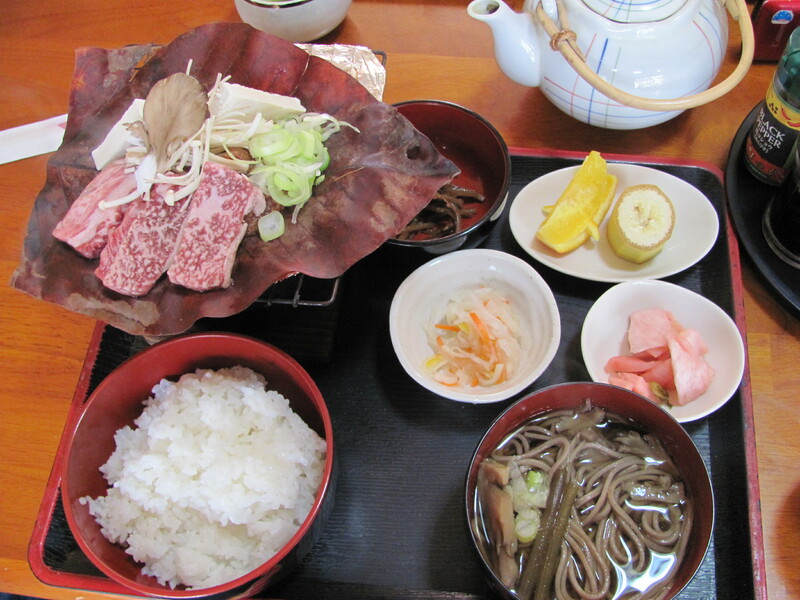 Sets include the hôba miso set (hida gyû hôba miso teishoku, 飛騨牛朴葉味噌定食), which came with pickles, pickled ginger, kinpira, rice, a small bowl of soba, fruit, and the hôba miso yaki, which included onions, mushrooms, Hida beef, and tofu. 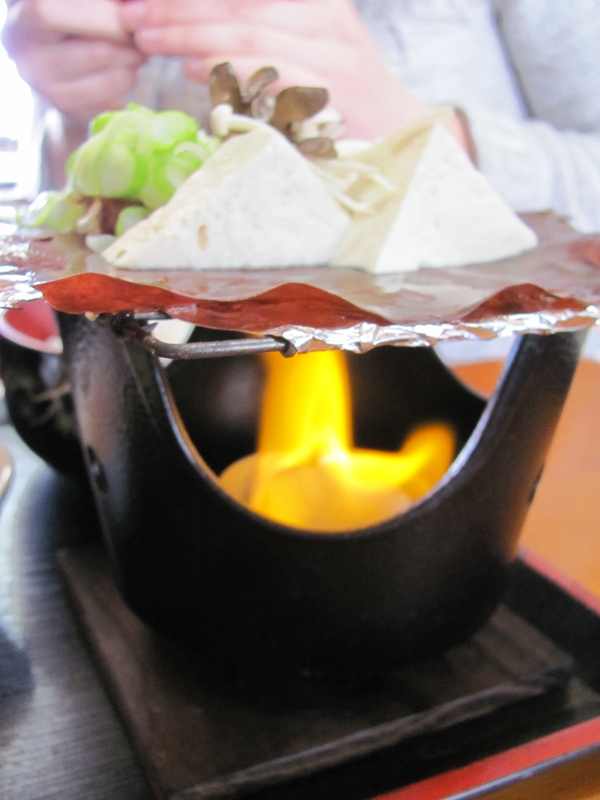 To enjoy the hôba miso yaki, a staff member brings out a Sterno-like device, which is placed into a ceramic or metal grill and lit. The magnolia leaf rests on a piece of foil on top of the grate, and the heat cooks your food on top of this leaf. When the miso starts to bubble and thicken, you stir it all together and enjoy. It’s not the prettiest meal, but it’s one of the tastiest. The Hida beef is marbled and melts in your mouth; the umami of the magnolia leaf mixed with the mushrooms, tofu, onions, and beef is divine. Also, a lot of the fun is just waiting on your food to cook while you enjoy your soba and okazu. Believe me, if it had been proper to lick the miso off the leaf, I would have. This set is 1300 yen, as is the Hida beef skewer set (hida gyû kushi yaki don, 飛騨牛串焼き丼) (also available a la carte). One of the skewers was spicy, and the staff even asked if that were okay, which I thought was very conscientious. 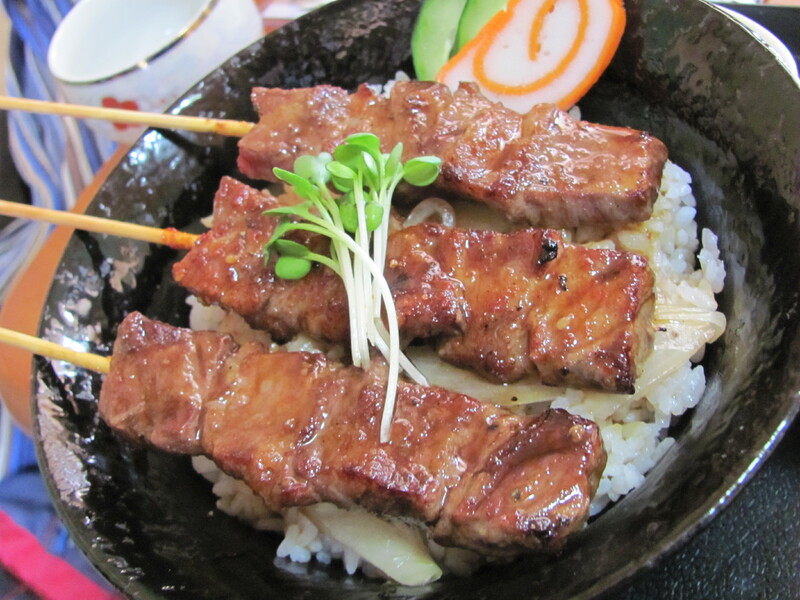 Apparently the juices and marinade in this kebab-donburi hybrid drip onto the rice and make it even more delicious. Unfortunately, this isn’t the most vegetarian-friendly restaurant. However, for the pescetarian, there is the salt-roasted sardine (iwashi shiyaki teishoku, イワシ塩焼き定食) set for 1000 yen (or the sardine a la cart), as well as udon and soba (900 yen each), which might not contain meat but probably have non-vegan stock, if that’s a concern for you. The soba that came with our sets was excellent and locally made, so if you are a noodle aficionado, be sure to give the soba a try. On our table was a notebook for guests to sign, so I made sure to write the staff a nice note about how we were visiting from Kanazawa and how happy I was to have amazing food in a cozy and warm restaurant. 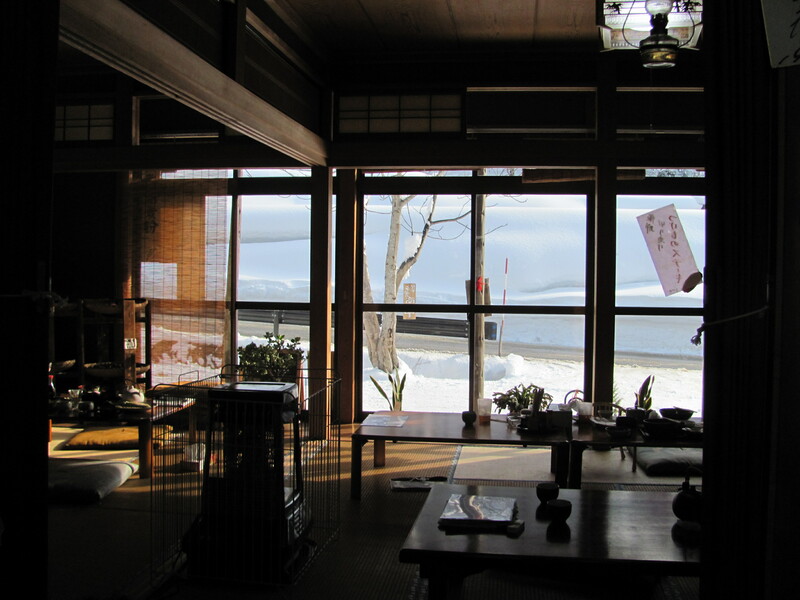 If you want a taste of Shirakawa-go’s famous cuisine, Hîragi will win you over with its simple but lovely cuisine and its hospitality. No fixed holidays. Available for large-group reservations. Wow. This looks wonderful. From the architecture and cozy wooden decor, to the regional specialty foods… (Also, I miss snow.) I’ve heard rumor of Hida-gyû – it was good? Had not heard of hôba miso yaki, though. Rikaichan tells me it’s just grilled magnolia leaves. Doesn’t sound very tasty. But, then, if you’re grilling various foods on/with the leaves, that’s a whole different story. … Those top two photos are so gorgeous!! Wonderful article, thank you! I look forward to many more. I’m new to Gifu ken as I was in Nagasaki ken before. I LOVE otsukemono and venture to try them all and even try to make my own (so far happier with others’ efforts). Thanks for commenting! 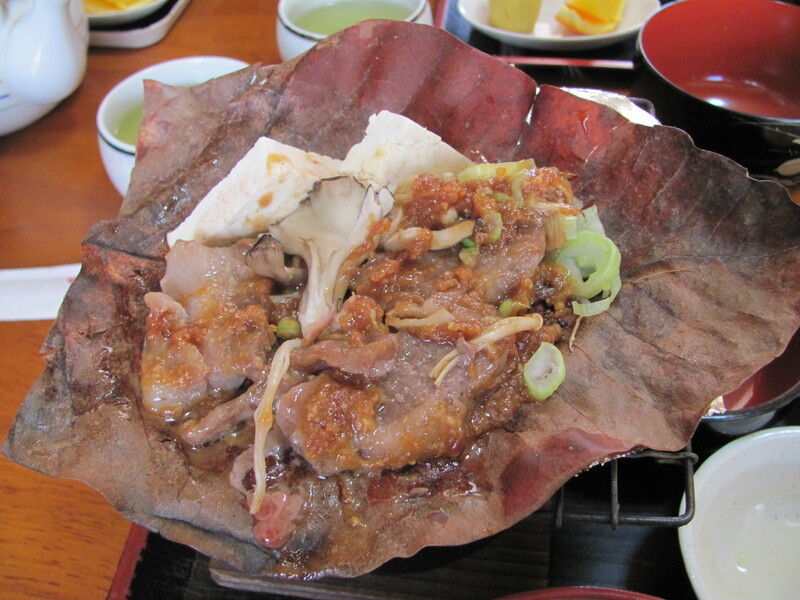 The Gifu area has some amazing food–I’ve written a bit about Takayama as well. 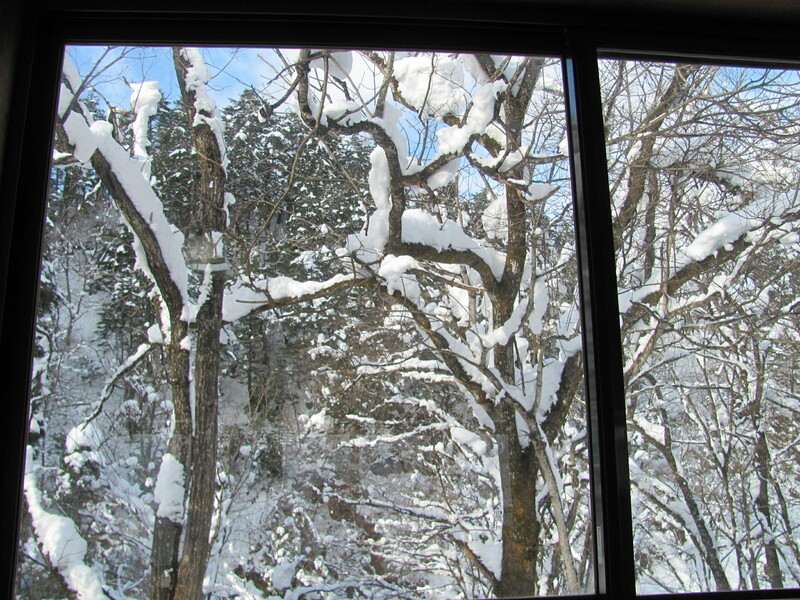 I’m a big fan of oyaki, which you can get near the border of Nagano (and probably elsewhere in the prefecture). Hope you’re enjoying the new location and its food! From Kanazawa, we took the Hokuriku Expressway to the Tokai-Hokuriku Expressway, then took that down to Shirakawa-go (hit Gokayama on the return trip). I’m not sure how the mountain highways are between Nagoya and Shirakawago, but the north side of the Tokai-Hokuriku was really clear and the village is close to the highway. Also, for what it’s worth, in the fall we took the 304 (the mountain pass) from Kanazawa to Gokayama, which was a beautiful but long drive. Your post is informative and makes to go to that restaurant you were mentioning. Can I know where it is near to? Shiroyama Viewpoint? It’s on the walking path up to the viewpoint. Thanks for reading!